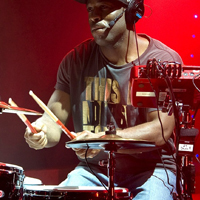 For decades drummers have played traditional drum sets and electronic drum kits. Today a technological development has yielded a futuristic drumming option: air drumming. Instead of buying a tangible set of old-school or electronic drums, now you can get an Aerodrums air drum kit. Since it’s a relatively new product on the market, both experienced drummers and drummers-to-be might need more information about this innovative drum set. This review will present the key features of the Aerodrums air drum kit and stress out some pros and cons of this product. When electronic drums came on stage in the 1970s, some musicians were delighted with their practical aspect. They were much lighter and easier to carry around than those large drum sets. The emergence of air drums is another step forward for practical drumming. The only thing you need to take to your practice session is the Aerodrums box, with all the items it contains. You also get the Aerodrums lamp within the box. This lamp contains a lens and is connected to a computer. Then there are two drumsticks. However, these aren’t regular sticks. They come with reflector heads, which receive a signal from the Aerodrums lamp. This is an important part of the entire product. For the sake of smooth playing, you also get two foot straps, which are used for the bass drum and hats. Finally, the Aerodrums box will contain a product key and a PS Eye High-Speed Camera, except for the US market. Here you need to buy the camera separately. This drumming system works in a much simpler way than you’d think. Basically, it relies on the motion capture technology that records the movements of the player. 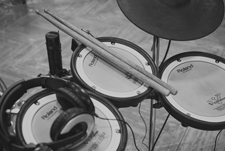 Here are the steps you need to follow in order to play your air drum kit. First and foremost, connect the lamp and the PS Eye Camera to your computer. They’re both connected via USB ports. The next step is to download the Aerodrums software from their website. It’s compatible with the Mac OS x 10.6 and later, as well as with Windows 7, 8, 10 and Windows Vista. As for the storage space, you’ll need between 800 and 900 MB of free space to download and install this software. After that, you should launch the downloaded software and start the installation process. You’ll have to enter the product key that you got in the Aerodrums box. As you set the software up, you’ll get some instructions from the software. At this moment, you should place the camera on the lamp. Then you’ll be instructed how to position your body in regard to the lamp-camera duet. It will be shown on the software interface. This is only an illustration where your drums would be placed in the space around you. This is where you’ll see where you should sit in order to ‘put’ those invisible drum elements within the right drumming distance. Also, the software might warn you to reduce the level of light in the room, since the lamp is sensitive to extensive light. The next thing you’ll see on the computer screen is a sketch of a drum set. The purple and the pink dot above the set represent the heads of your sticks. This picture will help you orientate in space and locate each and every drum within the air drum set. 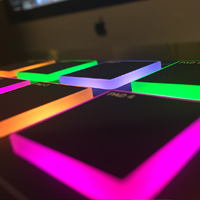 Now you can start your first air drumming session! You’ve probably noticed by now that once you get into the system behind the Aerodrums air drum kit, the drumming is pretty straightforward. 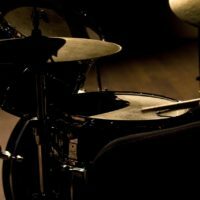 What you can do to improve your air drum experience is literally play with the sounds you get while drumming. This drum set brings seven integrated drum kits, as well as the range of 32 different sounds of percussions, cymbals, and drums. If you’ve ever played electronic drum kits, you know that those sets offer an abundance of sounds. In comparison with electronic drums, the Aerodrums kit falls behind when it comes to the number of sounds. Still, you can overcome this problem by inserting your own samples that you create on your computer. 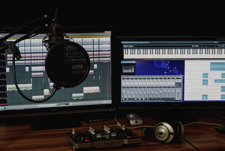 The more different sounds you create and add to the Aerodrums software, the larger variety of sounds you’ll be able to produce on your air drums. 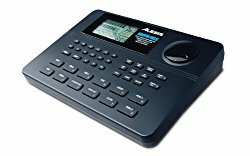 Since the Aerodrums is compatible with MIDI options, you can connect this set to any other hardware or software and increase the number of sounds. In 2016, Yann Moran and Richard Lee – the wise tandem behind the Aerodrums – announced that there will be a VR upgrade to their air drum kit. As a result, drummers will be able to project the once-invisible drums into the space around them. Instead of hitting the empty space before you, now you’ll be able to actually see the drum elements you’re hitting. This addition will mean a lot to drumming beginners. 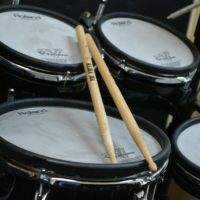 It will enable them to make faster progress and improve their drumming techniques. 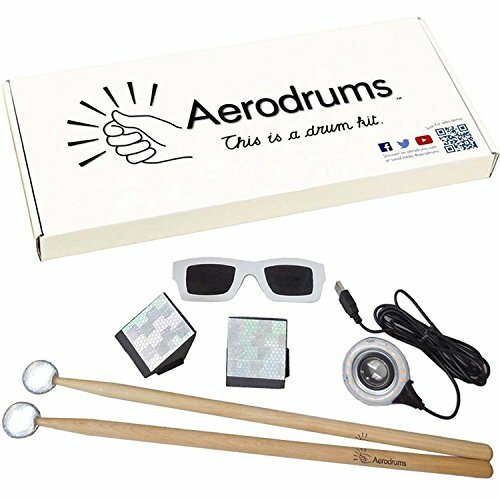 The only appendix to the items from the regular Aerodrums kit will be an Oculus Rift headset. Just like any innovative product, the Aerodrums air drum kit brings numerous benefits to its users, but it also has certain weak spots. We’ve listed the following pros and cons of this set. You can carry your set of air drums in your rucksack or even in a plastic bag. Its dimensions are 16.3 x 7.4 x 1.4 inches. Wherever you go, you can just plug the lamp and the camera into a computer and do your drumming rehearsal. Of course, the computers in question need to have the Aerodrums software installed. 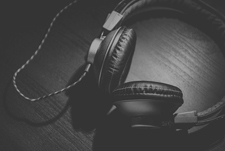 If you live in a block of flats, you just put on a pair of headphones and nobody will hear you playing your drums. Those drummers living in more relaxed surroundings can simply let their drumming blast through computer speakers or an amplifier. 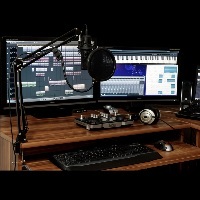 You can expand the number of additional sounds and drum kits, which is a great perk for a drum kit in this price range. The Aerodrums software interface on your computer screen is intuitive. The visual elements you follow there are clearly organized, which is extremely important for every drummer, especially the ones still learning how to play this instrument. For something that’s called an ‘air drum kit’, this set is pretty accurate when it comes to playing accuracy. Also, if you adjust the camera and the lamp well, there will be no latency, as well. The PS Eye Camera is pretty sensitive and bright, which is why you shouldn’t play your air drums in spaces that are far too bright. Also, we would recommend that you get sunglasses to protect your eyes against the camera brightness. However, cardboard ones come as part of the product. Some users might find setting the camera and the lamp a bit tricky. It’s nothing too complicated, but it does take some time to adjust these two parts. Follow this tutorial to find the perfect place for the camera. Some users have reported that the lamp is too sensitive to lights, not only to daylight but also to mere white walls in their rooms. So, you’ll need to find the right space in your home where you’ll be able to play this drum kit. Easily packed and light to carry around with you, the Aerodrums air drum kit is a nice option for drummers with some experience. This set will serve a great purpose as the rehearsal set or you could even try it out in a show! Also, the option to add as many sounds to it as you like significantly increase the number of playing variations. Together with the VR-update, this drum kit represents a great value for money and we recommend that you try it out.